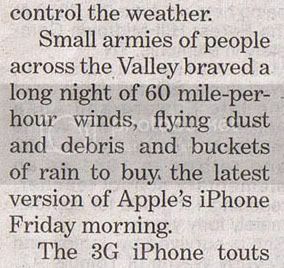 But how willing would most of us be to camp out all night through a monsoon storm, in 60 mile an hour winds, with debris flying about and ants crawling in our socks, so that we could gather or march in organized protest? I point a huge finger at myself when I ask that question. Though I would never camp out all night or wait in a huge line in order to buy some new gadget or to snag the hot new toy at Christmas (though I’ll admit to wanting an iPhone, I’m just not in a hurry), would I do it to protest war? Military families have been doing most of the heavy lifting throughout these two wars. The rest of us are just now getting a taste of personal sacrifice, though I suspect our wallets will empty a bit more before it gets better. The line from Point A to Point Gas-is-4-bucks-a-gallon hasn’t been very straight, and it’s taken a long time, but more of us are making changes to our lifestyle now because of increasing prices. Is now when we might finally voice our anger and frustration, and can we still do it proudly after waiting so long? After letting so much ride up until now? For six years, I’ve wondered what I can do, as one person, to make any sort of difference in our country, specifically to voice my protest against the war. At times, I’ve donated money to candidates I support and to organizations like MoveOn.org. I have used my vote, for what it was worth. But I wonder what each of us would give up–whether it’s time or comfort or money or time with our families–for social protest? And does protesting make an impact? What else can we all do? Does anyone else feel frustrated or powerless? Definitely frustrated and powerless and increasingly angry. Horribly, screamingly, this-has-got-to-stop angry. And not because gas and food have gotten more expensive. This all began for me when Bush was first elected and then re-elected and has just gotten more ulcer-inducing since. But I don’t know what we could do beyond the things you’ve mentioned (which I’ve done, too) that would be meaningful or useful. And I’m not at all certain that any of the things we HAVE done have meant a damn thing. I’m truly frightened. Tinas last blog post..See this plate? Now the Matron loves you more. She hosted several MoveOn parties!! You can make a difference! She worked for two years, without pay, to lead a grassroots coalition to convert local coal plants to natural gas. And she-they WON. Make every change possible and tell others. That’s the only way. And be present. I was thinking about a similar topic this morning – recycling and our environmental condition – global warming, etc. And I thought about how I do my best to conserve and protect.. I recycle, buy natural cleaning products, reuse plastic bottles so they don’t take up landfills. I don’t know. But in my heart I feel I’m doing what’s right for me. Not very comforting though – in the light of things. Great post. Honestly, with this administration, I’m not sure protests do any good. Bush and his cronies have said clearly that they don’t give a crap what the public thinks (that whole for the people, by the people apparently no longer matters). WIth a new administration? Hopefully it would. They’re supposed to be representing us. I must admit, I’ve done little besides donate money, vote and write a few letters to support my political views, and perhaps I should be doing more. 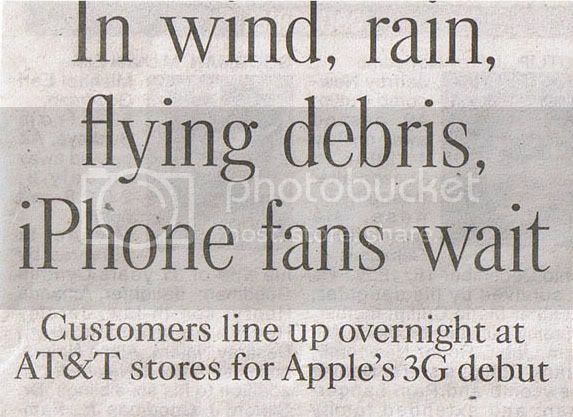 On the flip side, I’d never wait out all night long – rain or shine – for a new phone either. “Be the change you want to see…” Who the heck said that, anyway? ugghhhh going to sit in the corner for a bit of self-contemplation. p.s. I would not wait in line for a phone..
Vote for change is a start. Also, be willing to pay increased taxes for things like building public transportation infrastructure, education, renewable energry resources, health care. My husband and I go back and forth on this subject frequently. I am a dreamer and a visionary, and I truly believe that one person can make a difference. Unfortunately, when I try to make a difference, things usually don’t go very well, so my husband gets ammunition for his “realist”, doom and gloom philosophy. For instance, I was a sponsor for a child in the Dominican Republic through Children International, and his whole family would send me fabulous notes of appreciation and pictures of him. Then, suddenly and without warning, they dropped sponsorship in his area! I was boiling mad and made phone calls and sent letters, but convinced no one. I still think about him, and it makes me sad. I wholeheartedly agree with Ron. And to the Kate’s… it doesn’t matter what other people do. It’s what we do ourselves. We can’t control anyone but ourselves, and yes, that makes a difference. As for the rest, it’s about priorities. I think a lot of people like to talk (and complain) and spout opinions (and find support for their opinions), but it doesn’t go much farther (further?) than that. Their time is still spent in pursuit of the latest gadget or whatever. Not that there is anything wrong with that, but there is more wrong with society than its leaders. I’m sure that sounded harsh and judgmental. It wasn’t meant that way to anyone. I have just heard a lot of complaining (and with a 4-year-old whiner in my house, I can tell you I’m SICK of complaining), and not much else. How much pain is the average person willing to endure to reach the “ideal.” And what IS the “ideal?” One thing I know is that it is different for everyone, and sometimes my opinion is not the best one. Ahhhh, yes. I have, like Tina, been frustrated with that sinking-feeling-in-the-pit-of-my-stomach since the 2000 election. I have protested, I have sent letters – a power company here wants to set up a COAL plant nearby! Coal! How crazy is that? So I went to the public meeting and spoke my piece, e-mailed friends, etc. 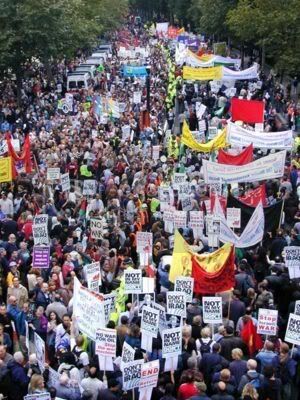 I’ve attended several peace rallies. I support CHANGE – I do think people are finally fed up with our corrupt system. They relate to the world differently because of how they are being raised. Frustrated, powerless, wretched. That pretty much sums it up. If I think too much about the war, I want to get in bed and pull up the covers. I just don’t know what to do. Physically, it would be really hard for me to camp out anywhere, anytime, for any reason. But I would much rather camp out for a protest than to camp out for a gadget. If you want to see a cool gadget that was delivered to my door yesterday (no lines required), take a peek at my latest post. As for the war, if texting will help, I’m all over it. BUT I did back in the 60’s mix it up and protested a lot .. I was in the huge NOW march in NYC and it was a heady experience … today I prefer to rant at the TV from the couch. Well, first of all I would love and iPhone, but I am not going to change wireless providers to get one, so I will simply stick with what I have. Secondly, if you want to make a difference, think small. It isn’t about changing the world. None of us can do that individually, but if we think small and set and example for others to follow, we pay it forward in the long run. I have been maintaining the common area in our neighborhood, since no one else was doing it. It is gorgeious now, with flowers and no more weeds. No one asks me to do it, I just want to make some small corner of the world a better place. And if nothing comes from it, at least it increase my property value by some small amount. The point is to light a candle and not curse the darkness. Sometimes I feel overwhelmed by the way things are going, and how little we as a nation seem to care. But I do have hope and his name is Barack Obama. Moreover, I am not sure paying $4/gallon for gasoline qualifies as a “sacrifice” for Americans. Other nations have been paying the equivalent of this level (and higher) for years, and that was before the recent spike in oil prices. And more importantly, I would hesitate to put paying more for gas anywhere near the same category as one I would reserve for those who have served or have had family members serve in the war. Service members and their families deserve our respect and support. Admission to their group has a price far beyond the cost of gasoline. Still, I know what you’re getting at, and I agree. It’s too bad that most us (me included) tend not to pay all that much attention until it starts to hit us in the pocketbook. Sure, we can cheer (maybe even out loud if we’re really bold) when we see some small improvement or incremental bit of progress on any particular issue. But active involvement (maybe even with some of our own money — my biggest criticism of all-too-vocal Hollywood celebrities) does not materialize unless and until it starts to affect our own chosen lifestyle. However, failure to act until that point should not make us hesitate to get involved. If it’s the right thing to do, it’s the right thing to do — yesterday, today, or tomorrow. It just means we might have some catching up to do. I definitely feel powerless and frustrated and constantly have to remind myself that the small things I do may have untold impact – a lot harder to say than to believe. I definitely feel powerless and frustrated and constantly have to remind myself that the small things I do may have an untold impact – a lot harder to believe than to say. I’m sincerely hoping the coming elections bring about a change, a “change we can believe in,” in fact. Perhaps then we’ll truly “move on,” and dig our country out of the economic and woeful despair. P.S. I waited for the new iPhone. Okay, I lie. My Mom waited and called me when she was at the front of the line … which is to say, she called me while I was still sleeping. But I do love it. yup. Powerless indeed. And I never miss an election which doesn’t seem to be helping lately. I feel so powerless when I think about the troops, losing lives, our nation wasting so much money, for what? Are we going to win? Is anyone going to win? I’ll stop now. Next post: You can trust me. Really.